Want to tone up from the comfort of your home or favorite park? Today's episode is part 3 of a 3 part series covering exercises you can complete with minimal equipment. 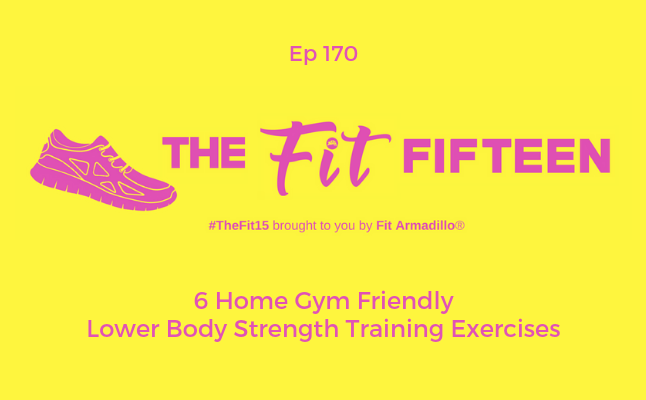 Episode 158 covered cardiovascular fitness moves, last week's episode (164) covered upper body strength training exercises, and this week's episode will review lower body strength training exercises that require no more than your own bodyweight and a step, park bench or sturdy chair. There are hundreds of combinations of workout routines you could create when you combine today's 6 home workout friendly lower body toning exercises with the 8 cardiovascular fitness moves I shared in the first episode in this series and 7 upper body strength training exercises from last week's episode. Some will be better for your fitness level than others. That's why I definitely recommend scheduling an online private fitness session with one of our talented personal trainers. Even one session can go a long way to helping you assess your current fitness level and understand how to create an efficient and effective home workout routine. I invite you to check the schedule HERE. 1. Warmup for 3-5 minutes with a walk or jog. Complete each exercise for 60 secs, rest for 60 secs. Repeat and cool down with a 3-5 minute walk or jog. You'll have worked out for about 40 minutes. Short on time? Cut the work or rest periods. You can do 30 secs of work and 30 secs of rest of 60 secs of work and 30 secs of rest to make it more challenging. 2. Complete the workout as in #1 above, but instead of resting jog. 3. Complete your warm-up and cool downs as described above, but add in some cardiovascular intervals or lower body strength training intervals. Not sure what to try? Check out episode 158, part one in this series for cardiovascular exercises you can do in a small space, and last week's episode for upper body strength training exercises.